Can you imagine playing a round of golf amongst the palm trees, with endless ocean views, a light summer breeze, and the sound of waves in the background? Hawaii has some of the best golf courses in the world and you can them whilst enjoying the Hawaiian island playground. Onboard a Hawaiian golf cruise, you will experience great food and wine, shopping, and activities and you can take advantage of the many sights and shore excursions should you wish to have a break from golf (but you won’t want to). Golfing is increasingly popular worldwide. Hawaii has some of the most beautiful golf courses in the world spread over 4 islands, any of them accessible by a Hawaiian cruise ship. The golf courses you will come across on your Hawaiian golf cruise are rated as some of the most beautiful golf courses in the world. Many of them rank among the Golf Digest's Top 100 Courses You Can Play and are world class courses catering for golfers of all experience levels. NCL (Norwegian Cruise Line) is the major operator of dedicated inter-island Hawaiian cruises and they offer 7 day dedicated Hawaiian golf cruises on their ships the Pride of America and Pride of Aloha. NCL have included some great features to make your Hawaiian golf cruise even more enjoyable. NCL will look after all aspects of the trip-planning, from advanced tee booking, transport, lessons, equipment, and player pairing. NCL also offer a range of club hire options so you can use the same set of clubs for the duration of the cruise. Alternatively, guests who bring their own clubs will automatically be enrolled in NCL's Club Valet program. The Valet service includes secure storage of clubs, daily club cleaning, daily delivery to the pier, and re-storage every day that you play. 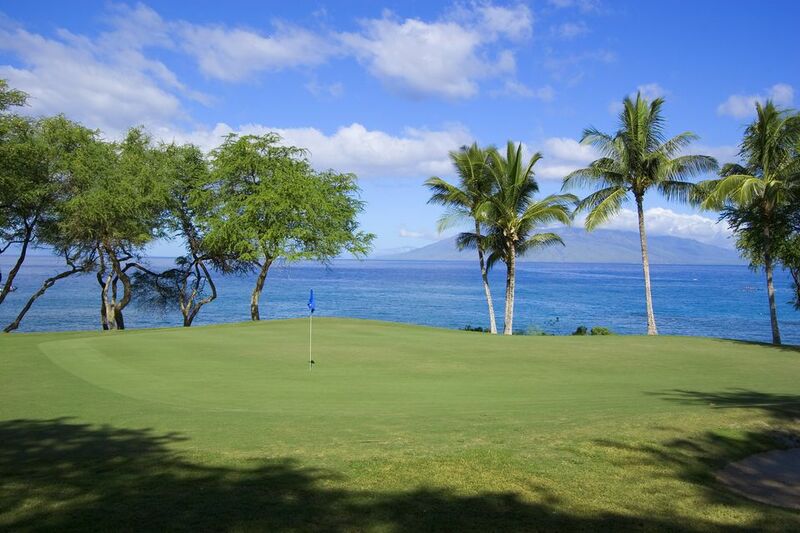 Hawaiian golf cruises have many advantages over standard land-based Hawaiian golf vacations. On your Hawaiian golf cruise, you will not need to worry about changing hotels, shuttle flights and transfers, rental cars on each island. By combining a Hawaiian golf vacation and a Hawaiian cruise vacation, you will find it will be more affordable than the usual land-based Hawaiian golf vacations due to minimizing transport, flights, and other logistical challenges. The beauty of a Hawaiian golf cruise is that you can enjoy your game of golf knowing the rest of the family is well catered to, with the many shore excursions and onboard activities offered for the duration of the Hawaiian golf cruise. On your Hawaiian golf cruise, you will have the selection of several Hawaiian golf courses spread over the four islands of Hawaii, Kauai, Maui, and Oahu. Below are just a couple of the most popular courses. Poipu Bay Golf Course, Kauai is probably Hawaii’s most popular golf course and a must-play destination. The course has been intricately inscribed along the cliffs of Kauai Island. The Poipu Bay Golf Course hosted the PGS Grand Slam event for a spectacular 13 consecutive years featuring some of the biggest names to walk its fairways. The challenging Poipu Bay Golf Course has some exciting high tech services such as the in-cart satellite navigation system, which shows your exact distance to the hole and pin placement. The Princeville at Hanalei Prince Course is one of America’s top golf courses. The prince course was named as Golf Digest’s Golf Digest number 1 golf course in the State of Hawaii. Golf Digest also rated it Number 5 of the Top 75 Resort Courses in the world and Number 66 of "America's 100 Greatest Courses."